As you are aware, Congressional leaders and President Obama have announced a bipartisan agreement to fund the government for two years, raise the debt ceiling, and avoid premium increases for Medicare beneficiaries. Of particular significance to the ASC industry is a provision — which OOSS strongly supports — that would place a moratorium on hospitals acquiring off-campus facilities like ASCs and physician offices and then charging the Medicare program and beneficiaries at the higher hospital rates. This means that a hospital purchase and conversion of an ASC would result in payments to the facility at the ASC rather than higher HOPD rates. This moratorium would apply to acquisitions after the date of enactment of the legislation and not to ASCs, offices, and other off-campus facilities acquired in the past. 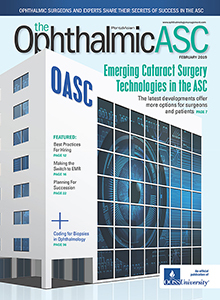 While there has not been a great deal of activity with respect to hospital acquisition of ophthalmic ASCs to date, this important legislation reflects the government’s increasing interest in site neutrality with respect to payment rates to providers. Should you have any questions, please contact OOSS Washington Counsel, Michael Romansky, JD, at mromansky@localhost:8080/ooss.